The No. 20 Quinnipiac Bobcats (4-0-0, 0-0-0 ECAC Hockey) will host the American International College Yellow Jackets (2-3-1, 2-1-1 Atlantic Hockey) on Saturday at 7 p.m. in Hamden. The Bobcats are off to a hot start in 2018 as they’ve won their first four games of the season, including a 4-1 win over the Yellow Jackets on Friday in Springfield, Mass. 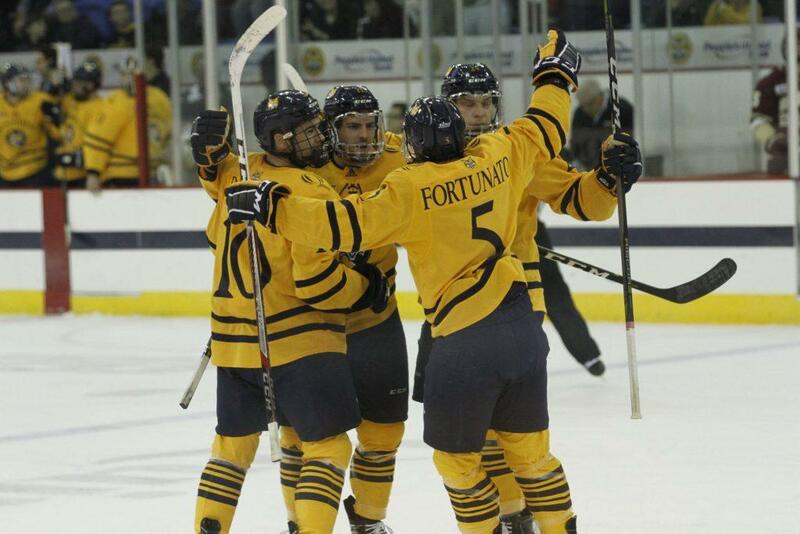 Quinnipiac is nationally ranked for the first time since early last season and has started 4-0-0 for the first time since their 2015-16 season in which they went all the way to the Frozen Four. The Yellow Jackets enter Hamden looking to split the home ad home series. The Detroit Red Wings third-round draft pick has been a brick wall for the Bobcats in the first three games of 2018 recording 54 saves for a .931 save percentage and a 1.34 goals against average. Petruzzelli was instrumental in last Friday’s win over Boston College posting his first career shutout with 21 saves. Andrew Shortridge started in net on Friday, so expect Rand Pecknold to go back to Petruzzelli as the Bobcats look to keep their hot start going. Kapcheck burst on to the scene last year for the Yellow Jackets, scoring 7 goals and 19 assists in 39 games played, earning him 2017 Atlantic Hockey Rookie of the Year honors and a nomination for the Hobey Baker Award. His 26 points broke a school record for single season points by a defenseman and he has already tallied 5 points in 5 games for the Yellow Jackets this season. Kapcheck will have to make a big impact in this game if AIC is going to pull an upset. The Bobcats have a lot of momentum heading into this game coming off of a big win and some national attention. In order to keep the momentum going, they need to stick to the things that have gotten them there. Defensively, they’ve done a phenomenal job of blocking shots and getting pucks away from Petruzzelli. Offensively, they’re moving the puck tremendously through the neutral zone and it’s led to many of their scoring chances. This is the Bobcats last tune up before they begin ECAC play, and if they want to start conference play undefeated, they’re going to need to stay disciplined. The Bobcats are coming back to Hamden playing as well as they’ve played in a long time, so how do you stop them? Start fast. An early goal takes away home ice and gives you all the momentum. The Yellow Jackets allowed an early goal on Friday and never recovered. If that happens again, they’re going to have a tough time in Hamden, as the Bobcats would be playing with a lot confidence on home ice. Make sure to tune in on Saturday at 7 p.m. to QBSN’s live broadcast of Quinnipiac vs. American International College hockey from the Frank Perrotti Jr. Arena at the People’s United Center in Hamden, Connecticut. Steven Pappas and Ryan Flaherty will be on the call of the game. For live updates throughout the game, follow @QBSN, @StevenPappas_23, and @RyanFlaherty18 on Twitter.